Amunix is an industry leader in the discovery and development of long-acting protein- and peptide therapeutics. 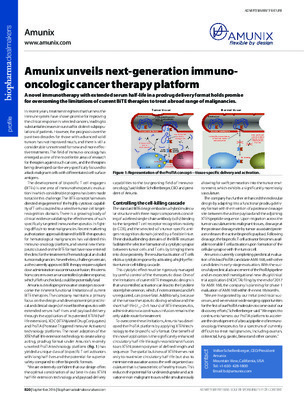 Founded in 2006, Amunix’ pipeline products are based on its proprietary XTEN® half-life extension, XDC drug-conjugate delivery and ProTIA pro-drug, bispecific T cell engager platform technologies. Located in Mountain View, CA, Amunix is progressing the development of its internal pipeline and also has ongoing collaborations with a number of established and emerging biopharma corporations harnessing these delivery technologies in a wide range of therapeutic areas, delivering improved pharmaceutical safety, efficacy and dosing.